The majority of solar panels on domestic systems in the UK are around 10-20% efficient. Whilst this might sound like a low figure, a 4kw system could actually generate enough electricity to dramatically reduce your energy bills and carbon emissions. Solar panel efficiency can be impacted by factors like position on the roof, the efficiency of the system’s inverter and the type of material it is made of. What Affects Average Solar Panel Efficiency? There are a few main factors that affect the efficiency of your solar panels. Most of these should be considered before you have the system installed and a reputable solar installer will be able to advise you on the best options for your home. Just a small amount of shade on a solar panel can have a big impact, in fact some reports suggest as little as just 10% of the panel being in shade can reduce its efficiency by up to 50%! Before installing solar panels on your home, the installer should carry out a shading analysis to evaluate any potential issues from obstructions like chimneys or trees. In the UK it is recommended that solar panels are installed on south facing roofs for optimum efficiency. Whilst they can be placed on some East and West facing roofs, the output levels are a lot lower. The pitch, or angle of your roof can affect the number of hours of sunlight your panels receive in a day. For this reason it’s important to consider the pitch of your roof before installation. The best pitch for domestic solar arrays in the UK is around 30-45 degrees. Whilst regular rainfall can clean solar panels, occasionally they may need cleaning more thoroughly to remove any bird droppings or dirt that could be reducing efficiency. The easiest way to go about this is hiring a professional as they will have the experience and equipment to carry out the cleaning safely. Solar panels are designed to collect energy from the sun, but they can actually see a reduction in efficiency when they get too hot. This generally shouldn’t be a problem in the UK as we rarely see high enough temperatures to cause any issues. Efficiency is expressed as a percentage reached by a simple equation. The Eco Experts explain it as ‘the ratio of incoming sunlight to power out of the panel, expressed as a percentage.’ The majority of domestic solar PV panels in the UK have an efficiency level of between 10-20%. Which Solar PV Panels are the Most Efficient? This varies across different manufacturers and models, but most suppliers will provide you with a figure for the efficiency of their panels. Monocrystalline panels tend to have a higher level of efficiency than polycrystalline silicon however they are also more expensive so it is a consideration you should weigh up thoughtfully. In the table below, we’ve compared the highest efficiencies of the solar panels being manufactured for UK homes. The best way to ensure your solar PV system is as efficient as possible is to have an MCS certified and experienced solar installer assess your needs, which you can find using Solar Guide. Conventional solar panels have PV cells on one side, the side facing out from the roof, bifacial solar panels on the other hand, boast PV cells on the front and back. Installing bifacial solar panels on top of a reflective surface maximises energy generation, with some manufacturers claiming that they can produce up 30% more energy. So, How Efficient is Solar Power? While the average efficiency of solar panels might appear low at first glance, they can bring countless long-term and short-term benefits to your life. The reason most homeowners turn to solar energy is to reduce their ever increasing energy bills. Your own solar panel system would be generating free energy from the renewable source of the sun rather than getting it from your energy supplier. One concern, with UK homeowners especially, when it comes to installing solar panels is the lack of bright sunshine we get throughout the year. However, solar panels can still generate energy on cloudy days, allowing you to get the most out of your solar panels all year round. Solar is a renewable source of energy and unlike other sources of fuel, doesn’t require the burning of fossil fuels so your home will be running much more efficiently. Free, renewable energy generation with solar panels lessens your reliance on your energy supplier which, as we mentioned, will reduce your energy bills. So if you’ve been asking ‘how efficient would solar power be’ for your home then the answer is very, even in overcast UK weather. If lower energy bills all year round has convinced you to install a solar panel system on the roof of your home then the next step is deciding which solar panels you’d like installed. We compared the best solar panels available in 2019 and found that LG are currently manufacturing the most cost-effective system. Once you’ve decided, you’ll need to find a fully-qualified installer to carry out the installation and that’s where we can help. Complete one of our simple online forms and you’ll be contacted by up to 3 trustworthy solar engineers in your local area who will each provide a quote. 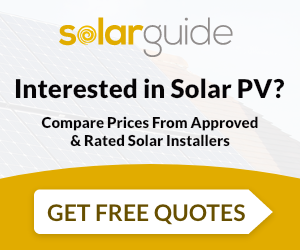 Receiving multiple quotes gives you the greatest chance of finding the best deal possible for the solar panel installation, as you can compare and pick the one that’s right for you.